In HSTOnline, a Past Due Assignment or Chore is any item which falls on a date prior to today's date and which has not been marked as Completed. 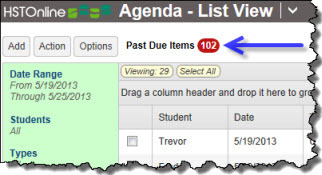 When a Student logs in under a Student User Account, and the 'Complete by Student' field has been enabled, they will get a notification regarding the number of their own Assignments and Chores which fall on dates prior to 'Today' which have not been marked as Complete by Student or Teacher. If the items have been marked as Teacher-Complete, they are no longer considered Past Due. When logged in under a Teacher User Account or as the Administrator, notifications will appear regarding the number of Assignments and Chores which fall on date prior to 'Today' which have not been marked as Complete by Teacher for any Student. Notifications appear at the bottom of the HSTOnline menu when you first login each day, and at the top of the Agenda - List View page. The notifications will remain until the Past Due items have been marked as Completed. Do Nothing - leave the item as 'Past Due' and simply mark it as complete once the work has been finished. Edit one or more Assignments or Chores to change any field. Student can change fields according to their user account permissions. Delete one or more Assignments or Chores in the list. Students may never delete any records. Mark the Assignment or Chore as Completed. Students can mark as Complete - Student; Teachers/Administrators will mark as Complete-Teacher. Reschedule one or more Assignments or Chores on the list to move them forward in time so that they are no longer Past Due. Students can reschedule according to their user account permissions. Notifications appear at the bottom of the HSTOnline menu when you first login each day, and at the top of the Agenda - List View pages. The notifications on the Agenda pages will remain until the Past Due items have been marked as Completed. Click or touch the notification to open the Past Due list. Edit: With one Assignment or Chore selected, this action becomes available. 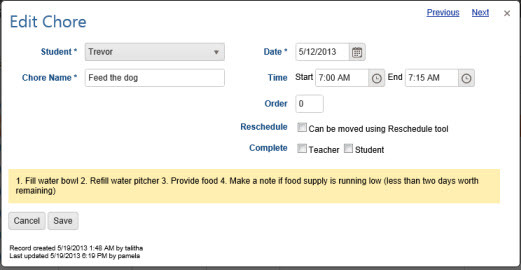 Choose edit to make changes to the selected Assignment or Chore. Multi-Edit: With two or more Assignments or two or more Chores selected, this action becomes available. 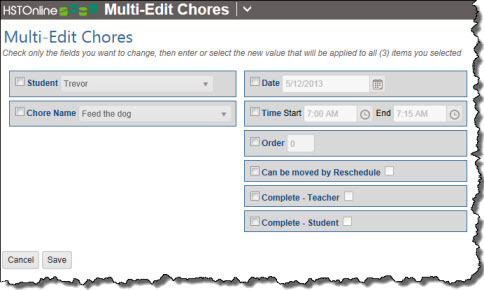 Choose this option to edit make changes to the selected Assignments or Chores. Delete: With two or more Assignments and/or Chores selected, this option becomes available. Choose this option to permanently delete the selected items from your database. This option is never visible when logged in under a Student Account. 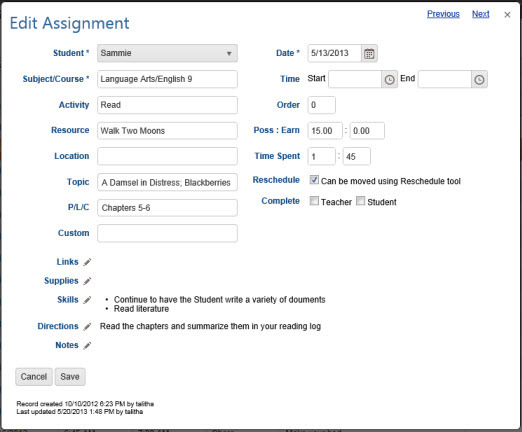 Mark as Complete: With one or more Assignments and/or Chores selected, this option becomes available. Choose this option to mark the selected items as complete. When logged in under a Student account, an S will be added to the Complete field; when logged in under an Administrator or Teacher account, a T will be added to the Complete field. Once marked as Complete, the items will fall off of the Past Due list. Reschedule: With one or more Activities selected, this option becomes available. Choose this option to permanently delete the selected items from your database. When logged in under a Student account, this option will only be available if the Student has permission to change Assignment Date and Time Block. Choose Columns: Click or touch this option to select which fields will be displayed in the Past Due list. You must select at least one column. Viewing: Indicates the number of Past Due items being displayed. Select All: Click or touch this badge to quickly select all the Assignments and Chores in the list. Selected: When one or more Assignments and/or Chores are highlighted, this badge will appear to show the number items selected. Click or touch this badge to deselect all selected items. You can edit any Past Due Assignment or Chore to change any aspect of that item - including the date or completion status. If you change the date to match today or a future date, or if you mark the item as Completed, it will fall off the Past Due List as it will no longer meet the criteria to be included on the list. 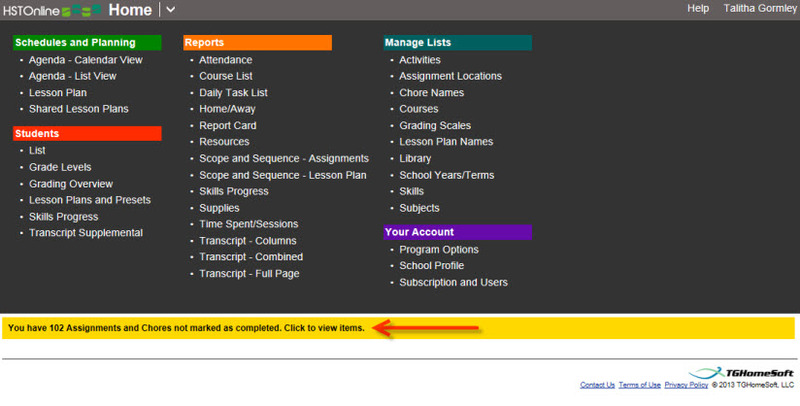 Click or touch the Past Due notification on the HSTOnline menu or on the Agenda - List View to open the Past Due list. On the Past Due page, double-click on the item you want to change to open the Edit window. Alternatively, you can click once on the item you want to change and then click the Action button and choose Edit to open the Edit window. On a touch device, touch the item you wish to edit and then touch the Action button and touch Edit to open the Edit window. Make whatever changes are needed to the Chore or Assignment. If you change the date to 'Today' or a future date, when you click Save the item will fall off the Past Due list. If you mark the item as Complete, when you click Save the item will fall off the Past Due list. Student users will only be able to edit fields based on their user account permissions. Cancel to abandon the changes and close the Edit window. Save to commit the changes to your Activity and close the Edit window. The Previous or Next hyperlink in the top right corner to save your changes to this item and move to the previous or next item in the list. If you are editing a Chore, the Previous/Next links will take you to the previous or next Chore on the list; if you are editing an Assignment, the Previous/Next links will take you to the previous or next Assignment on the list. You can click or touch Previous or Next until you have made all the changes you want and then click the Save button to end the Edit process. If you reach the beginning or end of the list when clicking or touching Previous or Next, the Edit window will close and you will be returned to the list view. The multi-edit feature allows you to make the same change to two or more items at the same time. 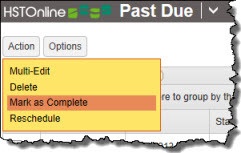 Click or touch the Past Due notification on the HSTOnline menu or the Agenda - List View to open the Past Due list. On the Past Due page, select the items you want to change. You can use the Grouping and Sorting features to isolate the items you want to change. You can use your mouse to click and drag over contiguous items of the same type in the list. On a touch device, you can touch and drag your finger over contiguous items of the same type in the list. 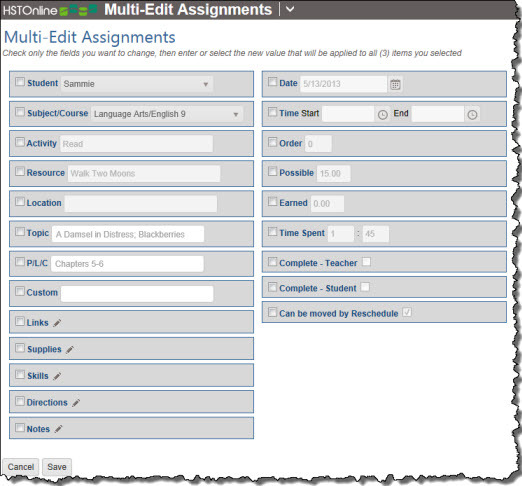 Your selection must include just Assignments or just Chores or the Multi-Edit option will be disabled. Click or touch the Action button and click or touch Multi-Edit to open the Multi-Edit window. Click or touch the checkbox next to each field you want to change for the selected items and make whatever changes are needed to the Chore or Assignment. Cancel to abandon the changes and close the Multi-Edit window. Save to commit the changes and close the Multi-Edit window. You can delete any Assignments or Chores which appear in the Past Due list to remove them completely from your database. Deleted items cannot be retrieved. Students: never have the option to delete any records. On the Past Due page, select the items you want to remove. You can use the Grouping and Sorting features to isolate the items you want to remove. You can delete Assignments and Chores at the same time. Click the checkbox for each item you want to remove. Click or touch the 'Select All' badge to select all the items in the list. HSTOnline will show you how many items of each type have been selected for deletion. 'Yes, I'm Sure' to complete the deletion process. HSTOnline will delete all selected items from your database. Deleted items cannot be retrieved. Students: can always mark their Chores or Assignments as Student-Complete. If the Complete by Student field is disabled, the Student will never receive a Past Due notification. On the Past Due page, select the items you want to remove. You can use the Grouping and Sorting features to isolate the items you want to remove. You can mark Assignments and Chores complete at the same time. Click the checkbox for each item you want to mark complete. Click or touch the Action button and click or touch 'Mark as Complete'. Student: Mark as Complete will add an S to the Complete column and check the Student box in the Complete field. Teacher/Administrator: Mark as Complete will add a T to the Complete column and check the Teacher box in the Complete field. You can choose to Reschedule any of the Assignments and Chores in the Past Due list to push them into the future. When you reschedule, items that start on the same date for a Student will be on the same new date in the future. Either click or touch Action and then Reschedule to automatically select all items in the Past Due list and open the Day and Date options page. Click or touch the 'Select All' badge to select all the items on the current page. Set the Day Options for the selected items. Skip Days Off: Check this box to prevent Rescheduled items from being placed on dates which are designated as a Day Off. Skip Non-School Days: Check this box to prevent Rescheduled items from being placed on non-school days, as indicated in your School Profile page. Select a Daily, Weekly, or Monthly pattern for HSTOnline to follow when moving your selected Assignments and Chores. See the Day Options Help Page for full details on these options. Set the Start date for the Reschedule process by entering a date using the mm/dd/yyyy format, or use the Calendar icon to select a date. This will be the first date used in the Reschedule process unless it violates one of your Day Options settings. Return to Past Due to cancel this process and return to the Past Due list. If you choose 'Continue to Preview', HSTOnline will show you the rescheduled Appointments and Chores with their Existing Date and the proposed New Date. Use this opportunity to review the items before accepting them to be added to your database. Items which cannot be moved because the 'Can be Rescheduled' box is unchecked will appear with a lavender background, showing the same Existing Date and New Date, and display a Status of 'Reschedule not allowed' (Preview 1). Items that Students cannot move due to a lack of permissions will appear with a lavender background, showing the same Existing Date and New Date, and display a Status of 'No Edit Permissions' (Preview 2). This will only appear when a Student is Rescheduling their own Assignments or Chores and lack sufficient permissions to do so. Return to Past Due to abandon this process and return to the Past Due list. You can create a printed list of Past Due Assignments and/or Chores for any date range using the Daily Task List report. The report can include any combination of Appointments, Assignments and/or Chores. You can export a list of Assignments and/or Chores from the Agenda - List View for any date range to a .CSV file using the Option: Export menu.